There have been a number of discussions on various online forums relating to the type of gas bottle required for use on caravans. However, the comments being shared in these forums are perpetuating urban myths that have no basis in fact. Specifically, claims that you can only use gas bottles with certain Coating Classification Codes on a caravan and that the use of the wrong gas bottle could void your insurance. There is no truth to either of these contentions. • There are no caravan specific standards, including types of coatings, that apply to the gas bottles themselves. • There are very specific requirements on how and where you store the gas bottles in and on a caravan. • The total number of gas bottles that you can legally carry is subject to control and can vary based on different state regulations. • Gas bottle holders must withstand a 4g load. To explain, a bit of background is in order. As with most urban myths, there is a bit of fact mixed in with misinformation. The paint coatings for caravan sized gas bottles are covered under AS2469-2005, in Section 11. This Standard specifies manufacturing requirements for welded carbon and stainless steel cylinders with water capacity not less than 0.1kg or more than 150kg. The Standard does NOT reference any application restrictions. There are four Coating Classification Codes in this manufacturing Standard. The Classification Codes are stamped into the neck ring of the gas bottles. Depending on the Classification Code, the number 1, 2, 3, or 4 will appear within a 10mm circle. The lower the number, the more durable the finish. These are hot dipped galvanised gas bottles. This would be the most durable finish but these bottles could cost 3X what a normal caravan gas bottle would cost. These are abrasive blasted, then coated with a base coat and a zinc rich top coat. These are sprayed with a single layer of a zinc coating. These are sprayed with a primer and a polyester top coat. This would be the least durable finish. In reference to the first myth, there is not, nor has there ever been a prohibition regarding the use of any Coating Classification Code gas bottle on a caravan. Many, many years ago there was a common sense “recommendation” suggesting that Code 4 bottles would not be ideal for continuous exposure on a caravan tow bar. This was never a ban and even the recommendation vanished from the Standards many years ago. We know this for a fact because the gentleman that wrote that recommendation, as a member of the Standards Committee, currently works for Elgas. The Standards also make no reference whatsoever to the Coating Codes being for specific applications, like marine, caravans or other applications. This is pure urban myth. With the advent of swap, even the issue of finish durability became a moot point. For example, SWAP’n’GO® paints more than half of the bottles that come through for refilling, making long term coating durability less of a necessity. Also, contrary to yet another urban myth, SWAP’n’GO does not blast the finish off of the swapped bottles, unless they are already heavily corroded. They do not compromise the original undercoat and top coat. They just spray over both with an additional top coat. There are specific requirements for gas bottle holders under the Australian Standard AS/NZS 5601.2:2013 Section 3.3. • It needs to be mounted on the tow bar or the caravan wall that faces the towing vehicle. 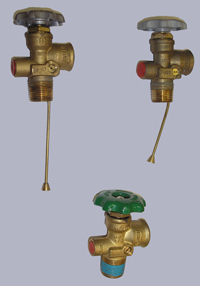 • It must be installed upright – with the valve at the top. • The gas bottle holder or carrier must be rigidly secured and able to withstand a steadily applied load equal to 4x the weight of a full gas bottle. • The mounting method must be capable of withstanding this applied load from any direction. There are specific requirements for caravan gas bottle storage compartments or lockers under the Australian Standard AS/NZS 5601.2:2013 Section 3.4. The supposed insurance requirement is just another myth. There are no grounds for an insurance company to reject a claim on the basis of the Coating Classification Code. This is because there is no Standard or legal requirement for any specific Coating Classification Code for a caravan application. In addition, we have never seen such a clause in any policy and the LPG industry association would almost surely oppose any such arbitrary and capricious clause. If anyone actually has a policy that states this, we would love to see a copy! In reading the online forums, there was another issue of GREAT SAFETY CONCERN that actually could affect your insurance. Contributors make mention of having 6, 8 or as many as 12 gas bottles. Separate from the Australian Standards, there are various state regulations that limit the number of gas bottles you can carry in a private vehicle. For example, Queensland limits you to two gas bottles in an enclosed vehicle. You are only allowed to transport larger gas bottles (9 kg or more) in an enclosed vehicle if you are taking them to be refilled or exchanged. The maximum bottle size allowed is 30L (13.5 kg) and you can only transport two gas bottles at any time. The regulation does not specify the type of enclosed vehicle so the regulation would be applicable to all vehicles with enclosures. If you are caught violating applicable regulations in any State, you may be fined or otherwise penalised, depending upon the State. The underlying issue here is that it is not safe to store or transport gas bottles in any enclosure, vehicluar or stationary, regardless of the regulations or penalties. Looking for ways around these rules, regulations, laws or guidelines is just not wise. We should all be focusing on safety as our first priority. In addition, an insurance company could be within their rights to deny coverage if you make a claim while you are breaking the law by carrying too many gas bottles. This would be especially true if there was a fire in which the extra bottles contributed to the blaze. Caravan owners should observe the relevant State laws regarding gas bottle quantities transported. In addition, gas bottles should only be transported in external holders or secured in a purpose built, ventilated and ignition source free compartment / locker. Details of these installation requirements are specified in AS5601.2-2010. Gas bottles should never be stored in any other enclosed compartment within the caravan. Caravan heaters gas or diesel - which should you choose? There are good caravan heaters available in either gas or diesel. 2. World Health Organisation: "Diesel Exhaust is Carcinogenic"
All of this was announced, back in 2012, by the International Agency for Research on Cancer (IARC), which is part of the World Health Organization (WHO). IARC has the task of identifying causes of cancer. IARC says diesel exhaust is “carcinogenic to humans”. Their conclusion was unanimous, based on "compelling" scientific evidence. Diesel exhaust fumes are classified as a Group 1 carcinogen, along with smoking, asbestos and other dangerous substances. Many people wonder why some BBQ gas bottles are labelled as “9kg” while others are labelled as “8.5kg” when they look the same? The fact is that they are one in the same. The filling of nominal “9kg” bottles with 8.5kg of gas was a safety initiative of the Australian LPG industry. The same is true of "4kg" bottles being filled with 3.7kg of gas. But why? Unfortunately, there are many LPG bottles that are labelled as 9kg or 4kg that are actually manufactured undersize, with less than the labelled capacity. This is a result of the manufacturing and design variances amongst the many manufacturers of gas bottles that are imported, into Australia, from many countries around the world. Surprisingly, Australia has no mandatory standard sizing, so they are all approved for sale. LPG bottles are designed to be full while allowing 20% of the space, called “ullage”, for the natural expansion of the LPG. Filling undersized bottles to a full 9kg or 4kg, thus leaving less than 20% ullage, would create a safety issue. Overfilling can result in gas venting from the pressure relief valves. This is especially true in the warm Australian climate. However, filling undersized gas bottles correctly and safely meant that the Australian suppliers were misrepresenting the contents as 9kg or 4kg when it was actually less. This put the industry in the untenable position of being either unsafe or misrepresenting the quantity of gas provided. Neither of these options was acceptable. The solution was to take into account the cylinder size variations and standardise on 8.5kg and 3.7kg refills. What About Refilling Instead of Swap? Unlike SWAP'n'GO® bottles, which are filled by weight on digital scales, refilling is done by decanting. The operator fills the bottle until some starts leaking out of the bleed screw. Refilling can result in either overfilling or under filling, as well as correct filling, depending on the gas cylinder and the operator filling it. In addition to the cylinder size variances, there can be variances in the dip tube lengths. Dip tubes can even be missing or have fallen out of the bottom of the valve. The accompanying picture shows some examples. Dip tubes lengths are important because they are connected to the bleed screws. The refill operator opens the bleed screw and fills the cylinder until the level of LPG reaches the bottom of the dip tube, at which point liquid LPG will start to bleed out. This is his signal that the cylinder is full. If the operator is slow to stop the flow, the result can be dangerous overfilling. Long dip tubes can result in under filling. Short or missing dip tubes will cause overfilling. 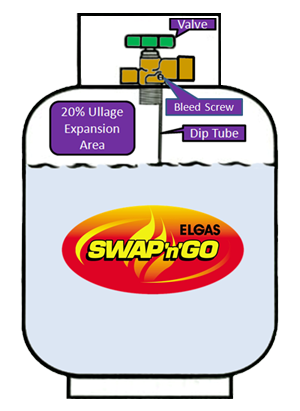 A missing dip tube is the worst case scenario, as the entire ullage space would be filled, allowing no room for expansion. This is one of the reasons that swap is a much safer alternative, as dip tube variances have no effect when filling by weight on digital scales. I was recently asked about yet another myth that I hadn't even heard before. In this one, swap cylinder gas contained an additive (no details on what or why) that over time contributed to the blocking of gas hoses and regulators. There is absolutely no truth to this. The only additive used with any LPG - Liquefied Petroleum Gas - is the stenching agent, used for safety reasons. It is added equally to all LPG regardless of use. The only exception is LPG used as a propellant. Having stinky hairspray would not go over big!